Despite the title of this post, I am not managing my own schedule well because it's 12:17 PM while I am typing this and my posts are usually scheduled to go live at 6 AM. Oops. I do, however, have some reflections on how exactly TO do this along with how I plan to change up my own in the near future. 1. Schedule in "me" time first. Admittedly, I have found myself ditching my time for yoga practice and fun reading in favor of 4 AM work sessions, but I am experimenting with a work schedule that starts at 10 AM in order to let me sleep until 5:30 or 6 AM, get in whatever workout I want to do, shower, make breakfast, etc. and have a morning that doesn't feel rushed. I read a comment by Melissa Hartwig once that said (paraphrased): If you own your own business and can't take an afternoon off, or start work when you want, then you're doing it wrong. 2. Plan meetings and/or calls at set times or days of the week. Similar to my email batching method (you can read about that here), I am working on only taking meetings and scheduling calls on certain days of the week (Thursdays and Fridays). I truly hate nothing more than running all over town every day of the week and never feeling like I have time to actually work because my meetings are taking over my time. I control this by only offering Thursdays and Fridays as my availability for these tasks. This also helps control back and forth emails trying to schedule things because there are less opportunities to schedule. Yikes! Easier said than done, but I am working to question every meeting, every call, and to make sure that my time spent on these projects aligns with my goals. If they don't require an immediate meeting or response, then I may schedule them, but it will be several weeks out. I also schedule work sessions directly into my calendar as this allows me to plan out my day and week. I have switched up my work schedule up so that my projects that take more mental energy (freelance writing, or creating marketing materials for Chic Stripes) take place Monday-Wednesday, the early part of the week, when I am fresh. Come Thursday and Friday, I am still working, but I am doing more menial tasks, or meetings or having my meetings or calls. I am tired by the end of the week, but there are some tasks that don't take as much energy, so I save them for the later part of the week. Are you a freelancer or have your own business? 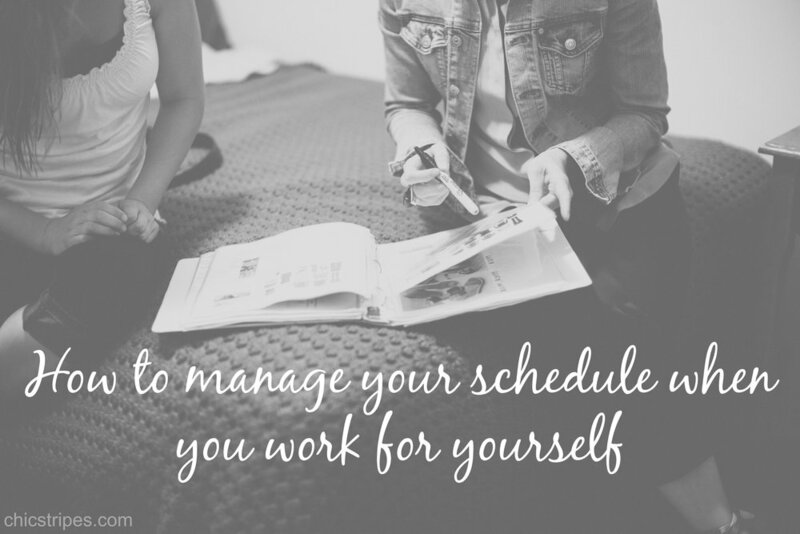 I'd love to hear how you manage your schedule!